If we want to use text in Machine Learning algorithms, we’ll have to convert then to a numerical representation. It should be no surprise that computers are very well at handling numbers. We convert text to a numerical representation called a feature vector. A feature vector can be as simple as a list of numbers. The bag-of-words model is one of the feature extraction algorithms for text. The bag of words model ignores grammar and order of words. 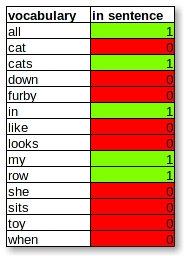 The list contains 14 unique words: the vocabulary. That’s why every document is represented by a feature vector of 14 elements. The number of elements is called the dimension. we’ll get a vector, the bag of words representation. We’ll define a collection of strings called a corpus. Then we’ll use the CountVectorizer to create vectors from the corpus.